https://matcha-jp.com/en/greatertokyo/5704 Visit Tochigi To Enjoy Delicious Strawberries And Gorgeous Flowers! Visit Tochigi To Enjoy Delicious Strawberries And Gorgeous Flowers! Tochigi is just an hour and a half away from Tokyo by express train. 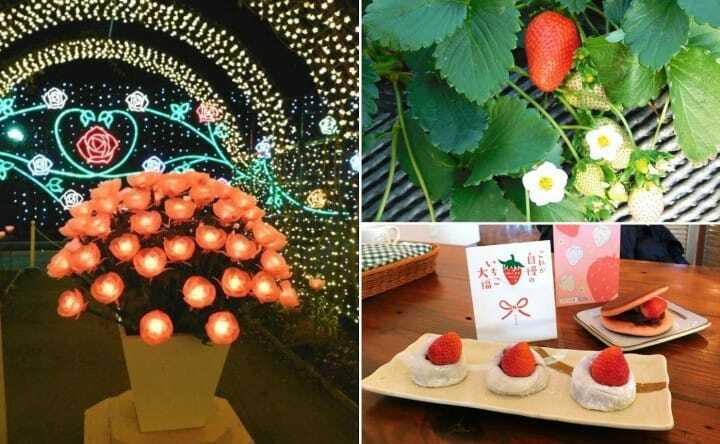 Here you can find some of the most delicious strawberries in the world, incredible ramen that warms you to the bone, great shopping, and incredible winter illuminations. It's Strawberry Time in Japan - Time to Head to Tochigi! Although strawberries are regarded as a summer fruit in the west, in Japan, strawberries are available almost all year long in Japan, and Tochigi prefecture is the place to go if you want some of the most delicious varieties of berries around. But there's also plenty more to discover in Tochigi! For example, some of the tastiest ramen, and one of Japan's top three winter illuminations is here as well - all just an hour away from Tokyo's Asakusa Station! The most convenient way to travel from Tokyo to Tochigi is by taking a Tobu Railway limited express train from Asakusa Station. I took the Revaty Kegon 11 departing at 9:00, which reached Tochigi Station after an hour. The Revaty is a modern and very comfortable train, traveling very fast and stopping only at a few major stations on its way. The ticket fare to Tochigi was only 2200 yen, including the fee for the reserved seat. While traveling, you can rest in your comfortable reclining seat or gaze out the window at the scenery. The view changes once you leave the metropolis behind and approach the green, hilly areas of Tochigi. Within Asakusa Station, you can find the TOBU Tourist Information Center ASAKUSA (TIC Asakusa). If you have any inquiries regarding the tickets or the train connections, please visit this information center. At Tochigi Station, right out front of the station there is a taxi stop, so I got in line, and, after a 15 minute drive along really beautiful country roads, I arrived at my first stop, Ichigo no Sato. Ichigo no Sato has been Japan's top strawberry producing farm for the past 15 years. Not only do they grow the most strawberries in their 100 plus greenhouses, but they also have full strawberry picking courses, where you can do "all-you-can-eat" type courses for 30 minutes. The price of this course varies during the season, and availability depends on the growth of the strawberries, but you can choose from two types of strawberry to pick as well: Tochiotome and Skyberry cultivars. I wasn't aware of the differences between the strawberries at first, but after visiting here, I learned a lot! For example, on the left is the Tochiotome, and the right is the Skyberry. Other than the incredible size difference, the Tochiotome is also sweeter than the Skyberry, while the Skyberry has firmer flesh. They also have plenty of strawberry souvenirs to choose from in their gift shop called Berry Berry Marche, such as strawberry candies, made with just fresh strawberries and pure sugar, but also one of the most incredible strawberry desserts at Ange Fraise, their onsite cafe and buffet restaurant. Hotcakes with a whipped cream mountain and plenty of freshly picked Tochiotome strawberries and a drizzle of their own specially made strawberry maple syrup. This dessert is just 1190 yen with tax and is the ideal treat after picking strawberries. Or, if you'd prefer something more traditionally Japanese, in their gift shop, you can pick up strawberry daifuku (three for 650 yen) or strawberry dorayaki (one for 250 yen). With a sweet strawberry-filled morning behind me, it was time for something a bit more savory. After taking a taxi back to Tochigi Station, I hopped on the JR Ryomo line to Sano Station. Sano is a charming area, with plenty of shops and spots to enjoy of its own, but one of the unique features of the area is their ramen. Right next to Sano Station is Nikkoken, a Sano ramen specialty shop that has an amazing interior. It's really easy to find too: just walk down the station steps, and look to your right. There is a huge billboard on the side of the building on the corner, which is where Nikkoken is located. Sano ramen, which was first made in Tochigi in 1948, is made with a soy sauce based broth and contains the usual ramen toppings. But what really makes it stand out are the noodles. Instead of being rolled flat and cut with a knife as other noodles are, the noodles for Sano ramen are struck with a green bamboo stalk, which gives them their characteristic wavy shape. A bowl of this lightly flavored ramen only costs 630 yen at Nikkoken. Another reason why this restaurant is so appealing, however, is that they have a fully Halal menu, which comes in English. They have Halal ramen, gyoza dumplings, fried chicken, and other Japanese restaurant favorites, that have been fully certified as Halal. If you aren't sure, just look at the walls of the restaurant! There are messages from satisfied customers from Bangladesh, Brunei, India, Hong Kong, Australia, and many other countries written right on the walls. 14:30 -- Sano Premium Outlets - Shopping for the Perfect Souvenir and Brand Items! Thoroughly satisfied with Tochigi's gourmet fare, I headed back to Sano Station to catch the Sano City Loop bus, which would bring me to my next destination. The bus stop is directly across from the station exit, so you can't miss it! Sano Premium Outlets is an outlet mall of 170 Japanese and international brands, including a Sanrio store, which handles Hello Kitty character items and other extremely cute products that are great as souvenirs. International visitors are sure to want to check out their selection of shops, but you should first head to the information center located in the heart of the mall, and present your passport at the desk. You'll be given a pamphlet that outlines the extra discounts you can receive at certain shops within the mall, which is sure to make your shopping trip even more fun - just don't forget to show your savings passport when making your purchases. I found something that I had been looking for for ages at the Sano Premium Outlets, so I was in really good spirits as the sun began to set. After a short shopping session, I hopped back on the loop bus to Sano Station, and set out for my last stop in Tochigi - one that I had been looking forward to all day. While it might not make sense to visit a flower park in the winter, Ashikaga Flower Park, is a must visit place all year round. Voted as one of Japan's best three illumination spots, and ranked as the number one illumination spot in Japan for two consecutive years in 2016 and 2017, Ashikaga Flower Park does not disappoint. I arrived right as the sun had set, and even before I got inside the park, I was already awestruck. There were so many displays to see, I couldn't decide where to look first. Ashikaga Flower Park is perhaps best known for its incredible wisteria flowers, which bloom each year in May, but they also come to life in winter with specially made wisteria blossom-shaped lights. Each strand is hand-fitted with these bulbs, and as you can see, the effect is jaw-dropping! Unfortunately, the illuminations are only around until February 4th, but the garden itself bursts into bloom in the spring. If you'd like to see just what awaits you when visiting the park from the spring onward, take a look at Dream Destination: Ashikaga Flower Park. And, if you are planning on visiting in the spring, there will be a new train station called Ashikaga Flower Park Station on the JR Ryomo Line opening right next to the side gate of the park, meaning that you can reach the park from that station in a minute or less. Business Time Varies by season. Please refer to the official site for details. Price Varies by season. Please refer to the official site for details. Delicious strawberries, savory regional ramen, long sought after shopping, and dazzling floral themed illuminations under a dark sky - what a perfect day! There are plenty of things to see and do in Tochigi, but for me, this was just the right mix of activities for a chilly winter's day. If you would like to enjoy a leisurely day filled with regional charm, then Tochigi's Oyama, Sano and Ashikaga areas are just the place to go. Lunch, souvenirs, etc. : about 5000 yen for the whole day!